DIY is headed to Hawaii. This week, the network announced their new TV show, Aloha Builds, will premiere in September. Aloha Builds premieres on DIY on September 10th at 10 p.m. ET/PT. New York [Aug. 13, 2018] For those who love sun, sand, surf and a budget-friendly dream home, Hawaii is the ultimate destination. 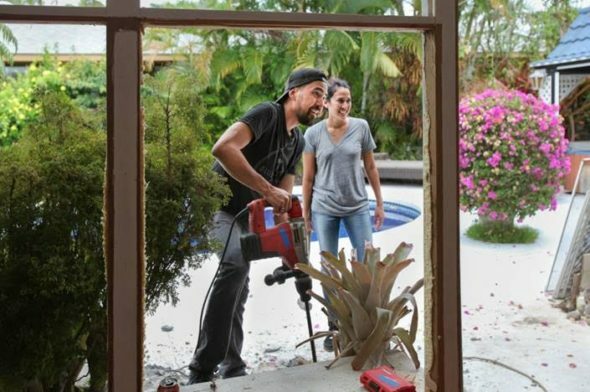 In DIY Network’s newest series, Aloha Builds, premiering Monday, Sept. 10, at 10 p.m. ET/PT, the Hawaii-born Jaime siblings—David, a licensed contractor, and Michelle, a designer—showcase the affordability of the island lifestyle. The 13-episode series follows the duo as they source local materials, such as lava rock tiles and sugar cane stalks, and upcycle salvaged items to create ingenious no-cost décor pieces to help families on a budget realize a fantasy tropical life. “Hawaii is paradise, which is why so many families are moving here, but home renovation can be pricey unless you know the right people,” said David, who explained the importance of working closely with local businesses to get the best deals. “With our local knowledge, we can save our clients a lot of money,” added Michelle. In the series premiere, David and Michelle help new homeowners revamp their outdated 1970s Honolulu home. To open the home’s odd layout, the duo removes several walls to create an airy kitchen with new windows that offer spectacular views of the lush island mountains. And, they create an open living room and dining area that is perfect for entertaining. To add natural elements throughout the home, they make shelves out of monkeypod trees, which would otherwise go to a landfill. They also repurpose the home’s original wood walls to create a custom-designed headboard for the master bedroom. What do you think? Are you a fan of renovation series? Will you watch Aloha Builds? More about: Aloha Builds, Aloha Builds: canceled or renewed?, DIY TV shows: canceled or renewed?